EU Trade Commissioner Cecilia Malmström will attend the "2017 EU-Korea Business Forum," to be hosted by the European Union (EU) Delegation to South Korea in Seoul on Sept. 21 (Thursday), 2017. The Swedish-born EU trade chief will deliver a keynote speech at the forum titled "The EU-Korea FTA: A Shelter against Protectionism and Supporting Growth to be held in the morning of the day at Le Meridien Hotel in Yeoksam 1-dong, Gangnam-Gu in southern part of Seoul, the EU Delegation to South Korea announced recently in its news release. 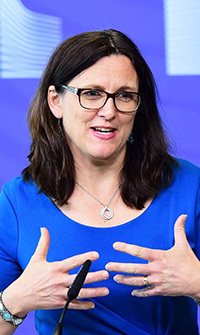 Madam Cecilia Malmström, a Swedish politician, has been serving as European Commissioner for Trade since 2014. She was a member of the European Parliament from 1999 to 2006. She also served as Swedish minister for European Union affairs between 2006 and 2010. She belongs to the Swedish Liberal Party. The welcoming remarks will be made by EU Ambassador to South Korea Michael Reiterer while introductory remarks will be delivered by ECCK Chairman Dimitris Psillakis. The business forum seeks to engage participants in a dialogue about the assessment of the EU-Korea FTA implementation and policy implications. Te Forum will present an assessment of the implementation of the EU-Korea FTA and of its effectiveness and efficiency in qualitative terms for EU business operators in Korea; importers and distributors in Korea, as well as for Korean consumers. Based on input from enterprises and stakeholders, the assessment reviews the different impacts of the FTA after six years of implementation, and identifies the potential challenges and opportunities to further deepen economic integration over the next years. Ms. Ingrid Drechsel, president of Bayer Korea and chairman of Korean German Chamber of Commerce and Industry (KGCCI); and Mr. Lee Dong Bok, director of FTA & Regional Studies Department of Korea International Trade Association (KITA). The forum is supported by the European Chamber of Commerce in Korea (ECCK) and by the Korea International Trade Association (KITA). The following is the full schedule of the event.